A role for carbon tax in China? From Left: Mr. Dimitri De Boer (Vice Chairman, CCF) (Moderator), Dr. Jiang Kejun (National Development and Reform Commission-ERI], Mr. Caspar Chiquet (South Pole Carb0n), and Professor Li Xin (Ministry of Finance). 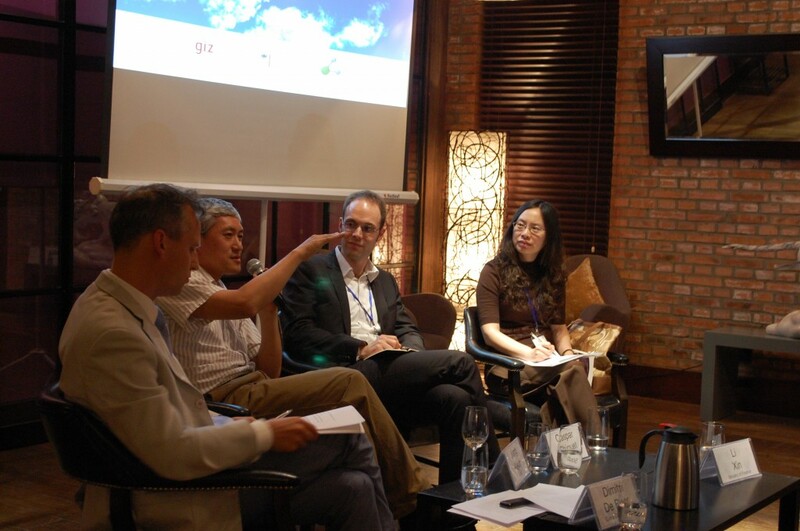 This event was the eighth in the China Low Carbon Leadership Network event series, jointly organized by the Deutsche Gesellschaft für Internationale Zusammenarbeit (GIZ) and China Carbon Forum (CCF). 74 representatives of government, NGOs, business and media joined GIZ and CCF to discuss the role of a possible carbon tax in China. A carbon tax is a form of price signal for business and households to shift economic activities away from high-carbon toward low-carbon alternatives. A tax could be incorporated into existing legal and governance structures with somewhat less transaction costs and economic uncertainty than a trading mechanism. (For example, a tax would not necessarily require a permit registry for auction, transactions and acquittal of tradable units). A tax may also be relatively politically manageable, given that it does not require an absolute cap on emissions, unlike a trading scheme. A low start price would allow time for industry to adapt, while a high forward price set in legislation would guide long-term investment decisions. China’s seven pilot emissions trading schemes (ETSs) demonstrate difficult short-term challenges for effective implementation. A carbon tax could be put in place ahead soon as either a transition measure toward trading, or a complementary measure alongside trading in the future. A carbon tax may be included within a broader environmental tax in the next five years. China’s 12th Five-Year Guideline (2011-2015) plans for an environmental tax. Whether this would include carbon remains to be seen. If no carbon tax is included in the environmental tax, a carbon tax could also be introduced separately later. For a carbon tax to be effective, the Chinese Government must increase policy coordination, address detailed design questions and improve monitoring, reporting and verification. The point of the supply chain to tax also remains an open question however taxing carbon at the source of fuel extraction is seen by some as the most efficient point to tax as it simplifies who is passing on the cost. This methodology could also be applied for other environmental pollutants (i.e. N2O and SO2) at the same time. A flexible carbon trading and management system – Switzerland’s case. As a non-EU member State Switzerland’s climate policy has been implemented independently of the EU ETS. A carbon tax the first economic tool used to manage environmental impacts. The government then created an opt-in domestic ETS (mainly targeting big emitters), whereby participants negotiate individual caps with the government and are then allocated tradable allowances. The third policy tool was created by gasoline importers. In order to avoid mandatory taxation or a cap, they proactively engaged the government and proposed a voluntary tax of one cent per litre of gasoline to invest in domestic and international greenhouse gas mitigation projects. The approach was successful, both in terms of emissions reductions, but also compliance costs for gasoline importers, which are significantly lower than having to comply with the carbon tax. China could make note that the effectiveness of the Swiss system is still unclear as the country is likely to miss its domestic 2012 target and resort to importing emissions allowances under the Kyoto Protocol. How to spend carbon tax revenue. A carbon price passed directly on to households’ risks regressive impacts (impacting low incomes proportionally more than high incomes). Policy can be designed to take a progressive approach (impacting high incomes proportionally more than low incomes). By providing tax breaks back to industry and individual households on other taxes, the incentive to emit carbon is reduced but the public is no worse off, only the tax base shifts and drives towards a less carbon intensive economy. Concerning EU ETS and its policies upon aviation, some speakers commented that China should support EU’s ETS and should rather do it earlier than later. China will pay very little money in this case since 85% of emissions allowances will be allocated for to airline operators for free. One major Chinese airline company has already progressed in energy savings and demonstrated the positive financial impacts. Taking part in an ETS scheme that covers aviation either at EU or domestic level can boost further innovation in China regarding jet fuel efficiency, use of biofuels by jets and efficiency improvement in new aircrafts. It is generally thought that China will implement a carbon tax and this is a long-term challenge that industry must prepare for. How and when the carbon tax will be implemented remains unclear, yet it is clear that low carbon technology is a priority for Chinese policy makers, and that market based mechanisms are an area which the Government is extensively researching. This research can only expedite the development of effective carbon pricing policy in China.